If you are somebody who lives the fast life in a city apartment or resides in a residential area near the city, you’d be familiar with how monotonous and boring can get sometimes living inside a concrete house with no connection to the natural world. To make up for this, you can fill your home with beautiful houseplants. Many people are opting to have houseplants inside their house to maintain it and see it grow. This helps in developing a sense of responsibility towards another living being that so many of us tend to ignore because we think it hampers our lives. Houseplants can make the walls of concrete come alive. They add color, vibrancy and new life to your home that will definitely revitalize you. Let us go over the benefits of having a houseplant. The primary reason that you should have a houseplant is that they are stress-busters. Our work-loaded busy day in a city, surrounded by structures of glass, concrete and electronic devices, wears us out. At our workplace, we need to keep up with our deadlines and deliver results so as to succeed. This is not an easy task to do, and we need something to rid us of the stress and digital screens at the end of the day. A houseplant will do just that. We need to maintain it to ensure that it lives and doing so will serve as a distraction from our daily lives. Looking at a houseplant grow at its own pace is also a stress-free activity as it makes us forget our anxiety for a while. Regardless of all the windows, ventilation methods, ceiling fans and air conditioners in our house, sometimes it still feels that we need fresher air to breathe properly. Houseplants improve the quality of air in your house. 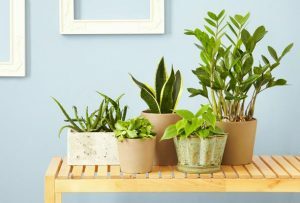 These houseplants are, just like every other plant in the world, breathe in carbon dioxide and releases oxygen which is beneficial to our health considering the pollution all around. When you gulp in fresh non-toxic air, you also get more energized to finish your work. Here’s a little something you probably didn’t know. Plants not only reduce air pollution but noise pollution as well. Ever wondered why you can hear yourself more clearly when you’re surrounded by trees? Research claims that plant leaves can absorb, refract and deflect noises in the surrounding area, reducing the impact on human ears. It makes your daily life so much better because your house feels less noisy and more tranquil. It will drown out the city cacophony that you are tired of. Now you have all the more reason to get a houseplant. 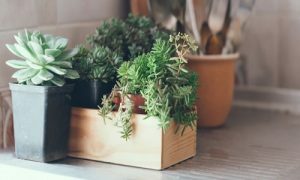 Having a houseplant not only improves the aesthetics of your place but can also affect the quality of living positively. They’re not any average indoor decoration- there’s a lot more to them. So raising one of these in your house, caring for it and maintaining its growth can make your life better considerably. Don’t believe us? Try getting one, and see if you are benefitted or not. Especially if you live alone and you are not into pets for companionship, a houseplant will add that little something more to your life.